A number of functional ingredients are added to meat to act as preservatives, flavouring, colouring, etc. These are generally dissolved into water to form a “brine” which is then injected into the meat. Another purpose of the brine is to increase the volume and weight (or yield) of the product. The increase in yield varies widely according to type, price and quality of the finished product, typically from below 15 to more than 50%. 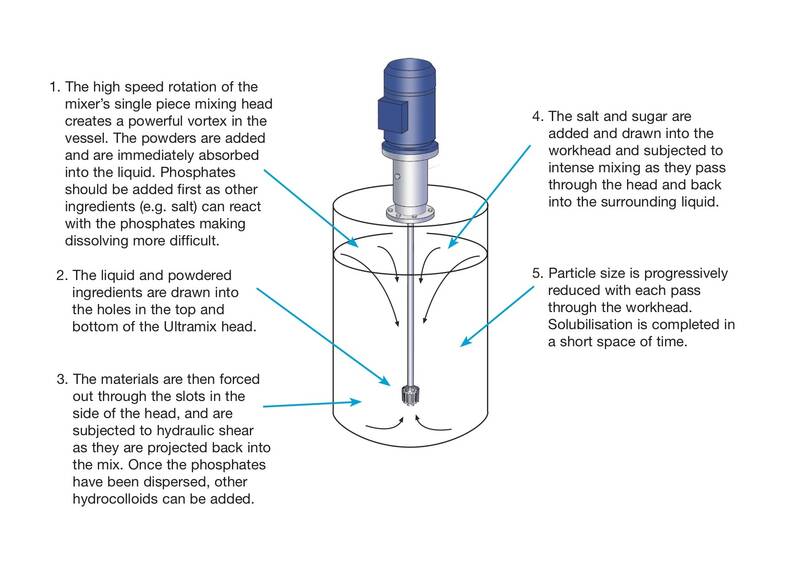 Similarly, stabilisers must be properly dispersed and completely hydrated to produce an agglomerate-free solution. Formulations with higher concentrations of salt have a high S.G. This requires the input of considerable energy to fully solubilise the salt, particularly at ambient or reduced temperatures. Phosphates are very difficult to dissolve. Incomplete solubilisation can cause water to separate from the meat after processing. Stabilisers tend to form agglomerates which cannot be broken down by agitation. Rapid mixing time minimises temperature rise. Rapid powder absorption rate minimises operator error. Yield of stabilisers is maximised, reducing costs. The Ultramix features a single-piece mixing head with no wearing parts or bushes. All the mixer’s product contact parts are in 316 stainless steel; cast iron or stainless steel motors should be be specified.